After pushing big kilometres for two days I decided to have a shorter day. Job was done by 1pm and the rest of the day is kicking back. I’d heard of the Mercer Tavern and Podges Place putting TA trampers up inthe back of the pub for free. Podge is a truck driver and frequently pulls up on the side of the road on the way to the quarry to hand out business cards ad he sees trampers, just to let them know of the hospitality that is on offer. Sounded good to me and it’s at a good distance from the next destnation. I’d heard about Podges place through word of mouth. So it was an easy day really. 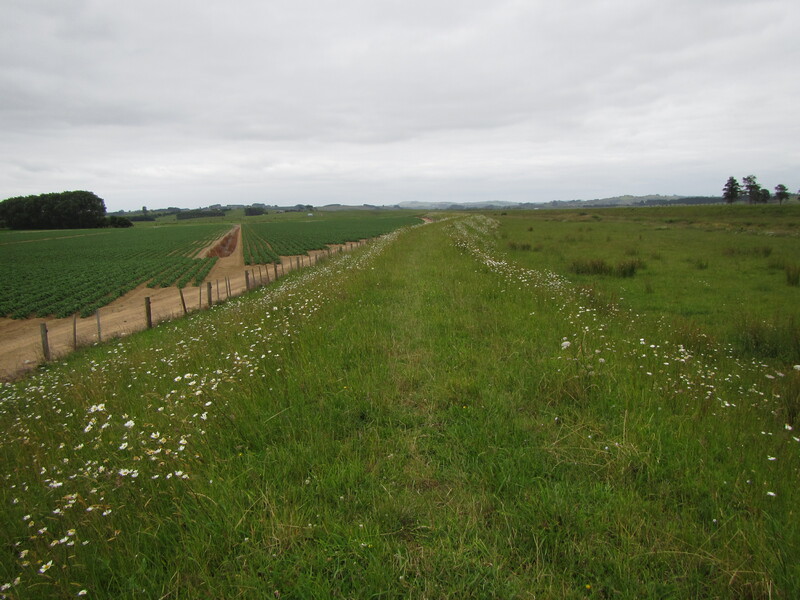 2km of benched track out to a country metalled road. Dawdling along this for about 6 km, singing songs out loud with no-one about. From there it was crossing a highway and following a stop bank or a levee babk for a good 6 or 7 kilometres. This was nice. You could see where you were headed and the turns in the levee made it easy to see where you were on the map. It was flat going through grass, some quite high grass in spots. I was just thankful that it wasn’t wet otherwise my lower half would have aturated just from collectng moisture from the vegetation. I played leap frog with Emma and Jay along the bank. As one would stop for a break the others would continue of their way taking the lead. A little more country road for a few more kilometres before passing over a rail line, under the SH1, the main state highway, and following along side the highway on a rough grass track into Mercer. As you cone into Mercer there was a highway stop with petrol, McDonalds and sone other shops. I pulled into to grab a coffee and met up with Emma and Jay again. Now we are relaxing in the back yard of Podges Place, essentially the Tavern and looking forward to pzza and beer for dinner. Rest of the afternoon to lounge about. There isn’t much to see or do in Mercer so here’s hoping I don’t make my way into the Tavern too early – I have a long day ahead tomorrow. Might try to push for a 40km day.